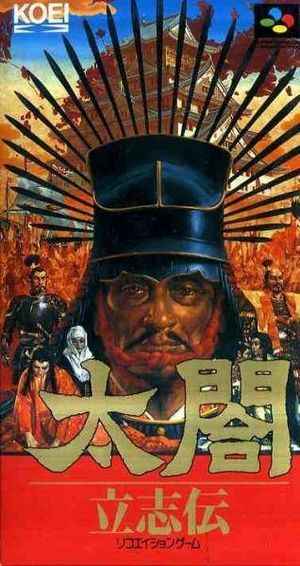 Taiko Risshiden is set in Sengoku-period Japan, where the player takes the role of a subordinate of warlord Oda Nobunaga named Tōkichirō Kinoshita. The player chooses one of several possible professions, rolls their attributes, and must become successful in their chosen life. Each month, the player receives orders from Nobunaga, and depending on the player's performance, their status will rise or fall. Success will allow the player to rise in rank and status, while failure will see the player's influence diminish, and possibly even result in execution. Depending on the player's actions, the scenario may stick closely to historical fact, or diverge wildly. The player can travel to various locations via the overworld map, and depending upon their play style, several different modes of play may open up. The player can choose to engage their enemies in turn-based tactical battles, or foster peace through diplomacy. It is also possible to go gambling, date women, and even assassinate enemy (or friendly) characters. However, all actions will have an impact on the player's reputation. The graph below charts the compatibility with Taiko Risshiden since Dolphin's 2.0 release, listing revisions only where a compatibility change occurred. This page was last edited on 31 December 2017, at 04:14.